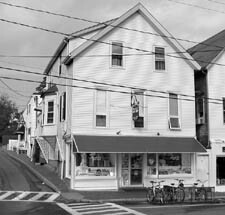 The following is a history of the buildings and businesses that have stood over the past two centuries in the location of what used to be Vincent's Paper Store and is today Mardell's Gift Shop, on the northwest corner of Main Street and Center Street in Vineyard Haven, Mass. Also see the Vincent Family Photo Album. Stan Lair said: "My memory goes back to about 1910. See I was born on October seventh, nineteen hundred and two. That would make me about eight years old. Well I really can remember things from around that age. Well, for instance, used to get our penny candy at - you know where Mardell's Gift Shop is? That used to be a paper store and candy store. It was Charlie Vincent's, C. M. Vincent's." Detail from a pre-1907 postcard showing the corner of the Vincent's Paper Store building at the intersection of Centre and Main. Lane's Block is visible in the background on the right. Until 1777 this property belonged to Tisbury merchant Thomas Winston and his partner Jonathan Allen Esq. (1734-1784) of Chilmark. There is no record of any buildings standing on this property at this time. Winston was the second husband of Mrs. Mercy (Nickerson) Chase, who with her first husband Abraham had maintained the "Great House" tavern to the south where today (2002) stands the town's public restrooms. In August 1777 the two men sold this tract of land, together with the Great House lot on the other side of the street ("on which the dwelling house stands which formerly belonged to Abraham Chase"), to Capt. Elijah Smith for 300 pounds. Edgartown "gentleman" Capt. Elijah Smith (1716-1802) was the son of John Smith and Hannah Pease, and the husband of Bethiah Harlock. Charles Banks suggests that Capt. Smith maintained the "Great House" tavern to the south during these years; however, this piece of the property probably remained empty at this time. the fences between him and the said Smith." No buildings are mentioned in the deed. According to old notes recorded shortly after the 1883 fire by John Holmes Jr. (1826-1887) and Charles A. Luce (and reprinted in the 1945 Gazette article "Notes of Old Houses"), the first building at this site was "One of the oldest historical houses. Erected previous to revolution, probably about 1750 [sic. ], by Silas Daggett, and kept by him as a tavern." Dr. Banks lists Capt. Silas Daggett (1757-1825?) as the first proprietor of this tavern, but it is evident from his birth date and the deeds mentioned above that he could not have built this structure before 1798. Capt. Daggett was a licensed inn-holder during 1798-1804. He was the son of carpenter Seth Daggett and Elizabeth West of Tisbury, and the husband of Deborah Butler (1759-1847). According to Banks, Daggett was also postmaster, and he probably maintained the post office at his tavern from 1798 until January 1803. Silas Daggett was the first owner, but it was his successor, Capt. David Smith who gave the tavern its name and Duncan Hines rating. Smith served Nevis rum brought in by Capt. Seth Daggett at $1.00 a gallon. A fearless mariner, Smith's best known exploit was running the British blockade of 1812-14 to bring in 'breadstuffs' from New York, only to be chased up Bass Creek by a couple of bargeloads of red coats, which fired on him and his son, but for some obscure reason, did not follow them." "Capt. David Smith succeeded [Daggett] in the [tavern] business and it was known for long years as Smith's Tavern, to which 'old salts' always alluded with the peculiar indicative smack which spoke louder than words. It was the tavern, par excellence, of this vicinity. "In the war of 1812 Capt. David Smith and son Nathan, returning from New York in their open boats, loaded with provisions, having escaped the vigilance of the British warbrig Nimrod and before they had discharged their cargo, two barges full of armed men were seen approaching their boats. To avoid capture the Smiths immediately got under way, passing through the Bass Creek and into the Lagoon Pond. The barges loaded their marines in the bend of the beach and opened fire on the fleeing boats. "Then it was that Mrs. Polly Smith, wife of Nathan, handed her babe to a girl in the house as she remarked, 'Hold this child, Sallie, while I go upstairs and see those red coat devils cannonade Nathan.'" David Smith's son Nathan Smith (1783-1857) inherited the tavern next, and turned it into his private residence. Nathan was married to Polly Jenkins Dunham. Their daughter Elwina Smith married Capt. Howes Norris. In April 1840, "yeoman" Nathan Smith and his wife sold this property to their son-in-law Capt. Norris for $1500. In the 1850 census, Nathan Smith is listed as a "farmer" living with Edward T. T. Smith. On his death record his occupation is again listed as a "yeoman." Nathan Smith (1783-1857) Photo from the Dorris Hough collection, courtesy Alice Robinson. Holmes and Luce wrote: "[This property] was later bought by [Nathan Smith's son-in-law] Capt. Howes Norris, who met death on board his ship Sharon, at the hands of savages from the King's Mill group of islands. House struck by lightning in 1851 and his wife killed." Capt. Howes Norris (1803-1842) was the son of Samuel Norris and Lucy Shaw of Eastville, and the husband of Elwina Manville Smith (1814-1851), who was the daughter of Nathan Smith. Norris was the captain of the Ship Leonidas of Fairhaven and New Bedford during its 1829-31 voyage. He died in November 1842 at sea, the victim of a mutiny. According to the book Anatomy of a Mutiny / Ship Sharon, 1842 by Philip F. Purrington (1968), "The Sharon mutiny was the direct result of the brutality of [Norris], a man whose mind was twisted by some severe derangement." [**See also the Nov 14, 1879 Gazette article on whaleship Sharon mutiny.] Capt. Thomas Harlock Smith (brother or nephew of Nathan Smith) served as first officer on the Sharon under the command of his in-law, Capt. Norris. The ship left Fairhaven, Mass. for the Pacific in May 1841. Capt. Norris was killed in November by mutinying "Kanakas" after most of the crew had lowered for whales. Capt. Smith recaptured the ship from the mutineers, completed the voyage as master, and returned to port in February 1845. (The log of this voyage is kept at the Martha's Vineyard Historical Society.) Word of Norris' death preceded the return of his ship, and his estate was inventoried in 1844. The dwelling house, lot and outhouses at this location were valued at $1400 initially, and then at $1100 in an 1851 assessment. His estate also included 1/32 part of the ship Sharon (valued at $1200), a small $30 sailboat, several valuable woodlots, as well as a large number of furnishings and household items that were sold at public auction. "THUNDERSTORM -- MELANCHOLY LOSS OF LIFE. -- One of the severest thunder storms within our remembrance, passed over the Vineyard on Tuesday forenoon last, by which two valuable lives were lost, and three or four persons injured. Mrs. Elwina Norris, widow of Capt. Howes Norris [was] instantly killed. The lightning descended through the roof, and shattered the whole house considerably. The fluid came out over the mantle piece in the room in which Mrs. Norris was sitting, with several friends, and is supposed to have entered her ear. It slightly scorched her neck, but there was no other trace of it on her person. She was instantly killed. No other person was injured to any extent. The hands on the clock were melted, as also the brasses which supported the fire set. - Mrs. Norris was about 44 years of age, a highly respected lady, and her death has cast a gloom over the circle in which she moved. - She leaves four children to mourn her loss. "The cloud from which the electric fluid was discharged, hung directly over Holmes Hole for twenty or thirty minutes, during which time there was an almost uninterrupted flash of lightning and roar of thunder. The scene was frightful and appalling, and made the stoutest hearts to quail." In November 1853, Octavia Norris married Dr. Ralph K. Jones, a young physician who had just started a practice in town. In June 1854, Shaw Norris, guardian of two of Octavia's siblings, and their brother Alonzo Norris of Rhode Island, sold their shares in the family property to Octavia's new husband, Dr. Jones, for $1325. By this time the abandoned(?) home was in poor condition - possibly left unrepaired since the storm - as Shaw testified that the property was "of little or no profit to the Heirs in its present condition." In a final tragic event in September 1858, Octavia's brother Alonzo (also called "Albert Howes Norris") was among the approximately 450 passengers lost in the fire on board the steamer Austria, on passage from Hamburg and Southampton to New York. (Only 67 were rescued out of 500-550 on board.) Norris had been absent from home nearly two years, "and when last heard from was 2d officer of ship Snap Dragon." Holmes and Luce wrote that this house "Was owned by and occupied by Dr. Ralph K. Jones, now of Bangor." Dr. Ralph Kneeland Jones (1823 - 1888) was born in Stockbridge MA, the son of Samuel Jones and Abby Maria Gilbert. Prior to his marriage, the 1850 Tisbury census lists Dr. Jones as a young physician living at the Mansion House. The 1858 Walling map also shows that a small, separate store building had been built on the edge of the property facing Main Street, on what is now the neighboring property. See Site #28 for more on this store. Holmes and Luce wrote that the house was "Then passed to R. W. Coffin of Holliston and leased by him to George N. Peakes, present postmaster." Richard W(hellen?) Coffin (1821-1901) was the son of Edgartown mason Thomas Coffin and his wife Ruann Pease Dunham. Richard Coffin learned the mason's trade, and was listed as an Edgartown bricklayer in 1846 and as an Edgartown mason in 1850. In 1849 he married Mary P. Butler (c.1819 - 1900) of Holmes Hole, the daughter of Samuel Butler and Mary Pease of Edgartown. Mary was born in Farmington Maine, but may also have been a descendant of former property owner Nathan Smith. In 1860 and 1865 Richard W. Coffin was listed as a Holmes Hole merchant, and his wife Mary was employed as a clerk in 1865. Rev. Warren Luce (?-1937), in his 1923 boyhood memories of the 1860s, recalled that Richard and Mary Coffin kept a grocery and dry goods store underneath the Baptist church [see Site #23.] 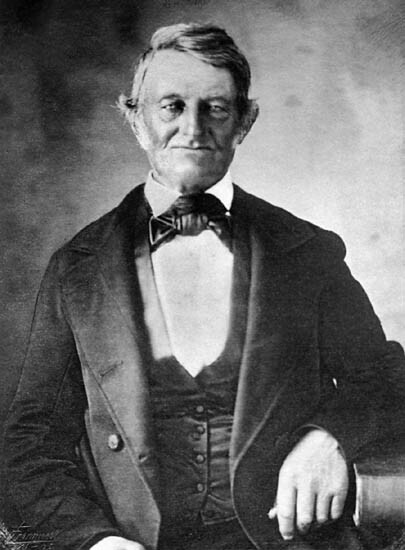 Coffin was also a deacon of the Baptist Church. In 1867 he built his own store on the north end of this property, and maintained his business here for the following seven years- see Site #28. George N. Peakes leased this building from the Coffins (during their absence) and ran it as a boarding house - the popular "Peakes House." George N. Peakes (1830-1896) was the son of Holmes Hole cabinetmaker James D. Peakes (previously of Eastham, Mass. and Fairfield, Me.) and Sophronia Manchester of Tisbury. In his youth, George Peakes worked as a mariner. In July 1861, James Peakes was appointed the postmaster of Holmes Hole, and by the following year George was made assistant postmaster. By 1865, George was also working as an expressman (The 1865 census listed father and son next door to R. W. Coffin.) In 1867 George married Mrs. Elizabeth G. "Lizzie" (Norton) Vincent (1847-1914) of Tisbury, the daughter of Tisbury mariner Richard L. Norton and Caroline L. Cottle. In 1870 George was still working as an expressman, and they were living at the Mansion House. The Peakes House became a popular summer boarding house during 1877-1883, and was often full. In 1879 the Gazette reported that a new lantern was placed in front of the Peakes House. The 1880 Tisbury census lists George Peakes, age 50, as a "Hotel Keeper." At about 10:30 on the evening of the great August 1883 fire, the Peakes House caught fire and this old historic home, together with its adjacent stable, was burned to the ground. The newspapers reported that the Peakes House was occupied by George N. Peakes and owned by Richard W. Coffin of Holliston, and that their loss in furniture was valued at $400, and on the building at $1800, all insured. George Peakes resigned as postmaster in 1885, and he died in March 1896. His widow Elizabeth died in 1914. The burned lot remained vacant for a year and a half before Coffin rebuilt. In March 1884, trees along Main street that had been killed by fire, including in front of R. W. Coffin's lot, were removed. 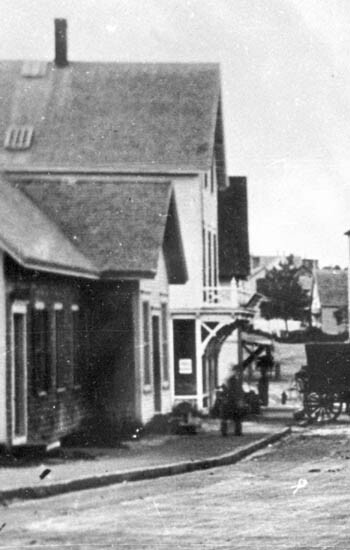 In April 1884 Main Street was widened, and Coffin was reimbursed for the encroachment upon his land. 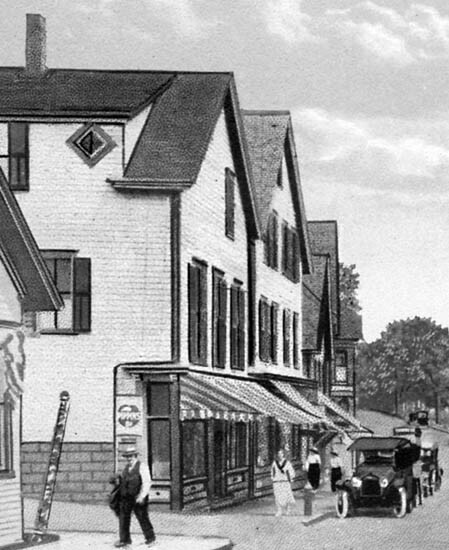 In early 1885, Coffin returned to the Vineyard from Holliston, and opened a grocery store across the street from the site of his former home, in Benjamin Dexter's building [see Site #26.] Then, in March 1885, the Gazette reported that R. W. Coffin was erecting a barn on the site of the one destroyed by the fire. Later that same month, the Gazette reported that "The barn owned by George Baxter (formerly owned by Elisha Luce) has been purchased by Mr. R. W. Coffin and it was moved this week to Mr. Coffin's lot on Main Street where it will be converted into a store. The building will be raised ten feet and the upper story fitted for a tenement, the lower floor to be used by the owner for his grocery business." (According to an article published in Gazette in November 1954, "Tradition has it that the original building was a barn and that it was moved from an up-Island locality, suspected to be Lambert's Cove or nearby, and remodeled extensively after it had been placed on its present site.") The only building known to have been moved onto Main Street after the fire, this may very well be the oldest structure standing today in the burned part of town. In February 1886 the Gazette reported that R. W. Coffin was occupying his new store on Main Street. In February 1887 the Gazette reported that "Chas. B. Stetson has returned to Medford, having been employed here by R. W. Coffin of the 'Central Grocery.'" In November 1887 Coffin advertised a "closing out" sale in the Martha's Vineyard Herald, and he closed his store permanently by early 1888. The 1900 Tisbury census lists Richard W. Coffin, age 79, as a "capitalist." Mary P. (Butler) Coffin died in July 1900 in Tisbury, and Richard W. Coffin died in February 1901 in Tisbury. 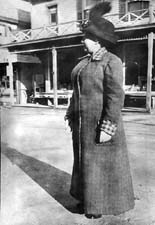 In May 1888 Mrs. H. B. Coffin, a New Bedford millinery dealer, opened a branch millinery store in R. W. Coffin's store. A. E. Coffin was given charge of it. It advertised "a large and complete line of millinery and hair goods" including "real ostrich tips" for 75¢, "all silk velvet" at $1 per yard, "real hair switch" 58¢, and "hair crimps" for 75¢. The store closed in July 1888. In November 1888 the paper reported that "Nathaniel H. Peakes is going into the insurance business here, opening an office at the store formerly occupied by R. W. Coffin." In December 1888 N. H. Peakes was reported to have a "new transparent sign" at his place of business at Main Street. Nathaniel Horton Peakes (1829-1901) was born in New Bedford, the son of Nathaniel Peakes and Mary A. Bosworth of Fairfield Maine and New Bedford. He was married to Martha J. ____ (c.1835-6 - 1904) of Maine. They had evidently lived in Canada during the late 1850s, and were wintering in Philadelphia by 1897. He is listed in the 1900 Tisbury census as a "capitalist." He died in Boston in 1901. In December 1888 the newspaper reported that "Luce Brothers have their holiday goods at the store formerly occupied by R. W. Coffin." (See Site #8.) Bernard Luce, the elder of the two brothers, was the son-in-law of R. W. Coffin. They evidently did not keep a store at this location more than a few months. In April 1889 "Chadwick's New Store" opened "at the old stand of R. W. Coffin." It was a "Fruit, Confectionery, Tobacco and Cigar Store" and served as an agency for pianos and organs. Charles F. Chadwick was born in 1863 in Holmes Hole, the son of Matthew Anderson Chadwick (1832-1909) and Elizabeth "Lizzie" Luce. He married Elizabeth Fowler "Lizzie" Taber (1864-1946) in 1887. She was the daughter of Vineyard Haven merchant James M. Taber (see Site #___) and his wife Mary P. Davis. During the winter of 1883-84 young Chadwick was listed as a clerk at Warren Luce's new grocery (see Site #35), and in October 1884 he was advertising in the Gazette as a piano tuner. According to a 1929 Gazette article, Chadwick was also a "leading spirit" in organizing the Vineyard Haven Town Band. Begun as the Vineyard Haven Brass Band Association in 1881, the original band consisted of 25 men and boys, including Alton Tuckerman (site #7), Timothy Shugrue (site #26), and many other local men. Chadwick had studied the cornet and had played on the mainland. The 1883 fire had burned the band's practice quarters, but not their instruments, and after the fire their practice room was located in the old sail loft over Capt. E. St. Croix Oliver's store on the corner of Union and Water streets. In May 1889, the newspaper reported that the express company, Hatch & Co., had moved their office from the "South End" to Chadwick's new store, "which is the most central location in town." Charles Chadwick had been the company's express agent for Vineyard Haven and Cottage City since before 1887. (According to Chadwick's obituary, "As a young man he was employed as an express messenger on the Vineyard steamers.") During the summer seasons of 1888 and 1889 Chadwick moved to Cottage City for the summer to take charge of Hatch & Co. office there. 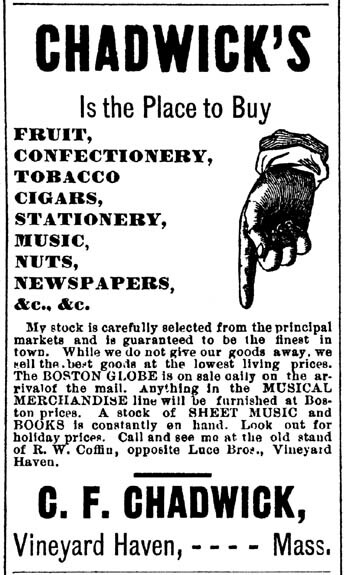 In 1889 Chadwick's store advertised roasted shelled peanuts, piano tuning, musical instruments and merchandise, stationery, the Vineyard Gazette, the Boston Globe, and the usual stock of confectionery, fruit, and cigars. In November 1889 Chadwick promoted his store with a "bean guessing" game, and gave away a watch as a prize. By 1890, Charles' father Matthew A. Chadwick became involved in the business. That year, town records show that both men sold stationery to the Tisbury school. In January 1891 the Gazette reported that "Mr. Chas. F. Chadwick, for the past six years connected with Hatch & Co.'s express, has resigned his position, to take effect soon. Mr. Albert Bearse, of New Bedford, will be his successor. Mr. Chadwick was the agent of the company at Cottage City during the years 1888 and '89, and at Vineyard Haven the balance of his term of service." The same month his store advertised piano tuning and repair; the sale of "pianos, organs, music, and musical merchandise" and "instruction in vocal music and on cornet." In February 1891 the Gazette reported that "Charles F. Chadwick, who recently resigned his position as express messenger between this town and New Bedford, has recently purchased the City Square Steam Laundry, Taunton, and will open it in a few days.
" However the store remained open through the spring and they continued to advertise the sale of the Gazette. On Memorial Day, a line of flags was strung from "B. Luce's store" to Chadwick's building. In June 1891, the paper reported that Charles Chadwick was living in Taunton, and in August that his father Matthew Chadwick was living in New Bedford. 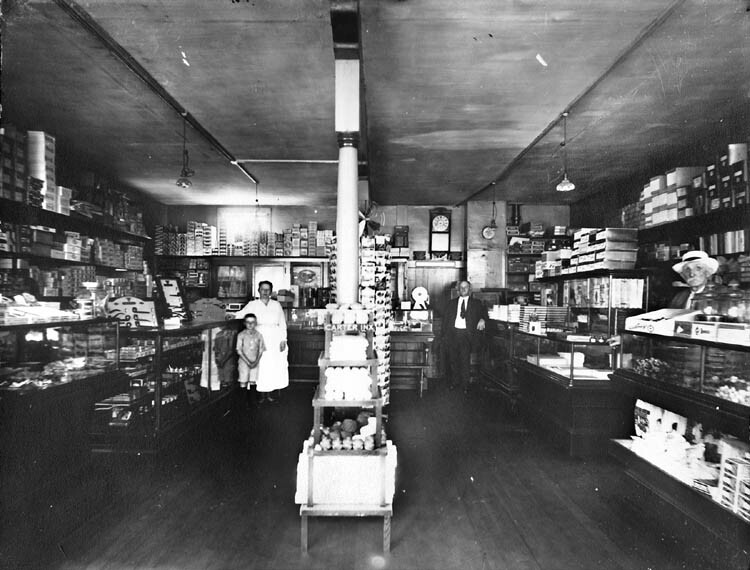 However, at about this time the elder Chadwick took over management of the store, and in September 1891 it was reported that "Mr. M. A. Chadwick has removed his fruit and confectionery store from the Coffin store to the one formerly occupied by H. W. Coye" on the corner of Main and Union (See Site #6.) Charles Chadwick's family left the same month to make their home in Taunton. Matthew Anderson Chadwick (1832-1909) was from New Bedford, the son of Thomas S. Chadwick and Sarah Crowell. Matthew married (2nd) Lizzie Luce of Tisbury, the dau. of Jesse and Emeline Luce. 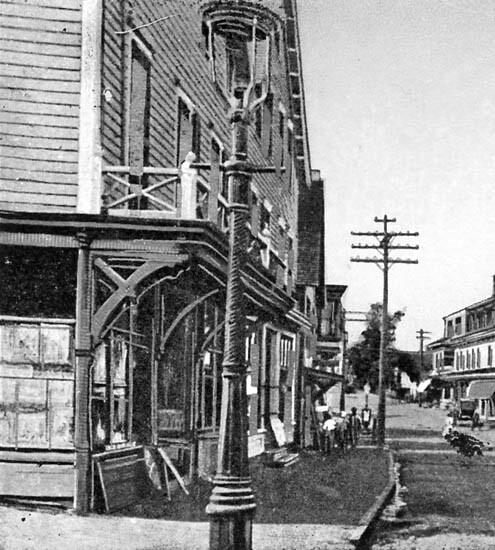 Charles F. Chadwick appeared in the 1892-93 Taunton city directories as the proprietor of the City Square Steam Laundry on Broadway. In June 1897 Charles F. Chadwick returned to Vineyard Haven briefly as a traveling piano and organ tuner. (Orders were left for him at his father's store.) In June 1905 it was reported that Matthew Chadwick and his wife were summering in Vineyard Haven, and that Mrs. Charles Chadwick was moving from Reading to Springfield, but maintained a summer cottage in Vineyard Haven. About 1906 he began work as a general sales manager for J. W. Steere and Son Organ Co., and was elected president of the company in 1912. He continued to visit the island, installing a new pipe organ in St. Andrew's Episcopal Church in 1912. 1924, 1927, and 1929 articles list his residence as Springfield. Chadwick died in Nova Scotia at the age of 73. His obituary notes, "A musician, he was the prime organizer of the Vineyard Haven Band, which he led for years. Known as an organ expert by churches and colleges over a wide area, Mr. Chadwick had in recent years devoted himself to the business of tuning and repairing organs. He was the builder of the municipal auditorium organ in Springfield. Mr. Chadwick was in the employ of the J. W. Steere and Son Organ Co., for more than twenty years. Late in his career with the company he became president and was active as its head until fire destroyed the building, after which the company was dissolved." 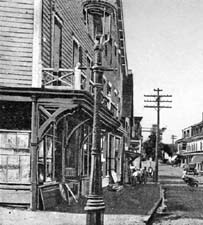 Coffin's store is visible as the tall building at the intersection. In December 1891, Miss Walker opened "a sale of xmas goods" at the store of R. W. Coffin. In 1894, the surviving heirs of Nathan Smith - Octavia N. Jones of Boston; Grace W. Nye, Nettie May Nye, Leila C. Nye, and Howes Norris of Cottage City; Elwina S. "Winnie" Campion of Cottage City; Clara A. Smith of Watertown; Howard M. Smith of Boston; Edward P. Smith of Norwalk, Ohio; together with Mary S.(?) Smith (widow of Edward T. T. Smith) and Adeline Smith (widow of Presbury L. Smith) - sold this 82' property (including Site #28 to the north) to Mary P. Coffin of Edgartown. In February 1896, this lot was referred to as "Coffin's Corner Store Lot." 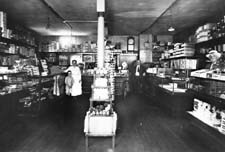 Gratia Harrington wrote of her memories of this store from the early 1890s in a 1967 Gazette: "[This] store, currently Vincent's, had various proprietors, and sold candy, tobacco, and papers. But, O Joy! It also had a small wooden keg filled with pickle limes in sea water to keep them fresh. They sold at six for a nickel. The pickle lime lover hunts in vain for them now. How our children are deprived! At the back of this store was a pot-bellied stove and some chairs; one of the village loafing places of which there were several." The 1954 Gazette article noted: "It is fairly well established that the original proprietor [of this store] first sold papers in the building now occupied by Trahan's candy kitchen, but that his tenure there was brief, and therefore it is quite soundly assumed that newspapers have been sold on Vincent's corner for sixty years or longer, under various proprietorships. 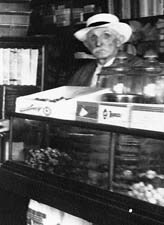 Among those proprietors was the late Henry Howes, and Mr. Vincent, who conducted the store far longer than anyone else, was there close to half a century as clerk, tenant, and owner, forty years as owner." Henry Sparrow Howes (1868 - 1912) operated a paper store at this location, although it his uncertain what year he began his business here. Born in East Harwich, Henry was the son of Sparrow Howes and Deborah A. Nickerson of Chatham and East Harwich. According to his obituary, "At twelve years of age Mr. Howes was severely injured and for over three years was scarcely able to walk and had to be carried by his brother Joseph to and from school in a small cart. This injury affected his health for the rest of his life, but his strong will power overcame many difficulties and aided him to make his way in the world. When a young man he tended the store and Postoffice at Tarapulin Cove." He reportedly came to Martha's Vineyard in the early 1890s, and "for a few years he kept a confectionery and cigar store where Mr. Walter Renear now has his real estate office. [See site #2.] From there he removed to the building now occupied by Mr. Chas. Vincent, where he added the periodicals to his merchandise." He married Lois A. Horton in 1896. 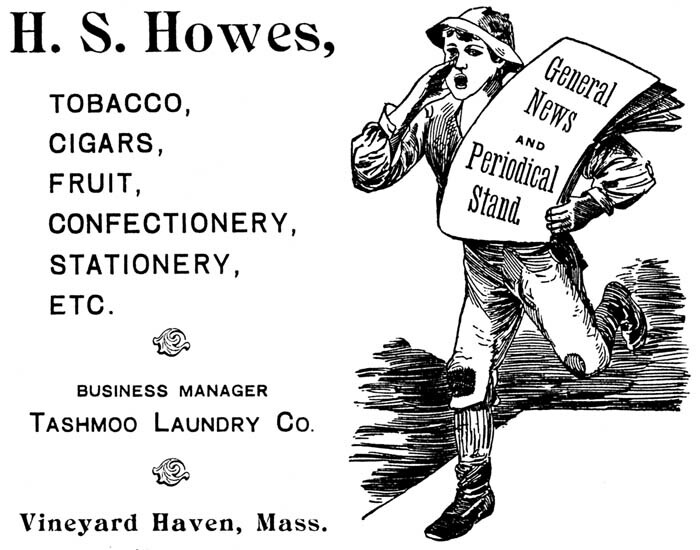 Henry S. Howes appears in the 1897 Vineyard Haven Directory under "Henry S. Howes - laundry, confectionery, stationery, newspapers, Main n. Centre." 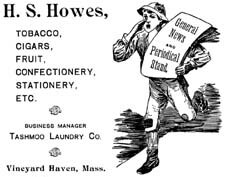 In December 1898 Henry S. Howes sold his laundry business to Timothy Shugrue and the paper reported that he intended to sell out all his business interests and move away from the island. However, he continued to advertise newspapers through the following year. In May 1899, H. S. Howes remained listed as a "newspaper agent." 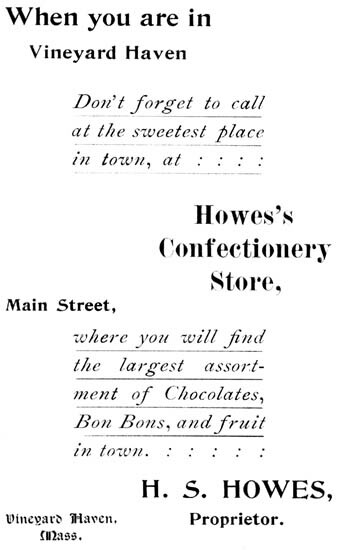 In December 1899 Charles Vincent was reported by the Gazette to have bought out the Howes' news stand and cigar store on Main Street, "the latter gone to Boston to enter into same business there." In April 1903 the Gazette reported that "Mr. Henry Howes' shop is to be occupied by Hinckley & Renear as an undertaking establishment." This may have been the barn the funeral directors used on Church Street in the early years of their business, possibly the former laundry plant of Tashmoo Laundry. In September 1899 elderly property owners Mary P. and Richard W. Coffin sold this 31' wide property to Charles H. Robinson of Malden. In doing so, this property was permanently divided from site #28 to the north, which until this time had been under one ownership. In December 1901, Charles H. Robinson (by then living in Providence) sold the property back to the Coffin's daughter, Sarah O. (Coffin) Luce. Stan Lair said: "Charlie Vincent's Paper Store, and candy, tobacco, fresh roasted peanuts, and so forth. At the back of this store was a great gathering place for the old-timers to sit around the old pot-bellied stove there, and smoke, spit and talk. Yes, they had spittoons back there! And Charlie always enjoyed chewing the rag with them. Charlie was quite a baseball fan. He enjoyed sports. Mr. Cleveland - that was Charlie Vincent's father-in-law - would sit out in front of the store in the summertime on a soda box, turning the handle on a peanut roaster. It was a funny-looking thing. Had a big drum on it, I would say maybe fifteen, eighteen inches in diameter, had a handle on the end, and under it was a fire of some sort. I presume it was either kerosene-operated or alcohol-operated, or something like that. He'd sit out there and crank that thing and roast peanuts, oh for hours at a time. Once in a while he would give us a couple of peanuts. This was a store where we always bought our penny candy, and of course it was bought after a lot of deliberation of course, as it is today by the kids. Today it is Mardell's Gift Shop." "And there's Morton Vincent. He was Charlie Vincent's son, who ran the paper store there on Center Street, on the corner of Center and Main. His mother was Rose Vincent, and Morton ran the store after they died, and then it was sold and Morton went into a different line of work. He told a lot of stories about ice boating in the old days. Of course he lived fairly early right on Tashmoo Lake. He did a lot of ice boating. His father was Charlie Vincent, as I've said, and he was called "Duffy", Duffy Vincent. I think he was named, sort of a nickname for Duffy Lewis, who was one of the fielders of the old Red Sox team. And that name was acquired by Charlie. He liked to play baseball in his younger days. But he ran that store for a long time." SL: Charlie Vincent, Duffy Vincent. Well, he ran the store originally that Morton finally inherited, which is Mardell's Gift Shop. In the back they had what was almost a club room. They had spittoons and settees, and men would get in back there every night and - something like the store up island there. BW: They lived upstairs over the store. SL: Yeah, they did, yeah. 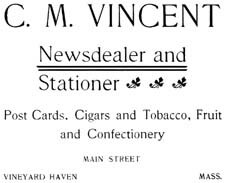 Charles Morton Vincent (1879-1933) worked as a teenager in Henry Howes' newspaper store (the 1897 Vineyard Haven directory lists him as a "clerk"), and then bought his employer's newsstand and cigar store in December 1899. Charles and his brother Francis C. "Frank" Vincent (1877-1949) were sons of Vineyard Haven fisherman Capt. Shubael Luce Vincent (1842-1926) and his wife Eveline F. Butler (1846-1921). The 1900 Tisbury census lists twenty-year-old Charles Vincent as a "news dealer" living at home with his parents. In April 1900 the Gazette makes reference to Charles Vincent's "confectionery store" and in June 1900 the paper reported that Roy Norton was working in Vincent's newsstand for the summer. In April 1903, the paper reported that "Mr. Matthew Chadwick has sold out his business to Mr. Charles Vincent." (At that time Chadwick's store was located across the street - see Site #5.) By 1905 Vincent was selling pipes and tobacco. In February 1905, Vincent married Rosanna Baker "Rose" Cleveland (1882-1946). She was the daughter of Henry N. Cleveland (1848-1929) and Ann Eliza (Fish) Gibbs (1853-1923) of Tisbury. In the 1910 census, Rose's parents were listed in their household. 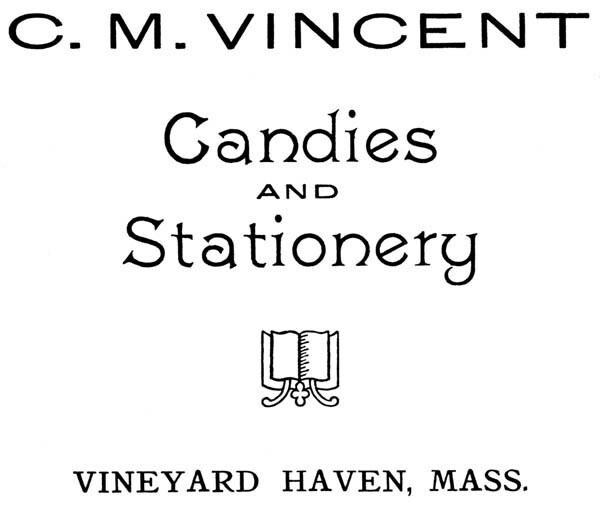 The 1907 Vineyard Haven directory lists "Charles M. Vincent - stationer, Main cor. Centre." Tisbury town records show that Vincent sold pens, pencils, and paper to the town in 1907. 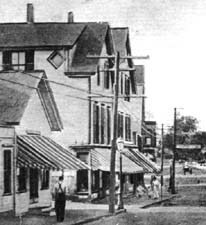 In April 1907 landlady Sarah O. Luce sold this property ("formerly known as Coffin's Corner Store Lot"), as well as Site #28 next door, to Josiah P. Bodfish. The paper reported that "Mrs. Sarah O. Luce has sold her stores on Main street (one now occupied by W. E. Godfrey, clothier, and the other by C. M. Vincent, newsdealer) to Mr. Josiah Bodfish." A June 1913 news item reported that Josiah P. Bodfish was having his "renting house" on the corner of Main and Centre enlarged to accommodate two tenants. Bodfish died in November 1913. This property, valued at $3500, was inherited by his widow Lucy P. Bodfish. The 1914 Sanborn map marks this store as "Stationery." Rose's father Henry Newell Cleveland (1848-1929) worked in the store during his retirement years. He was the son of Tisbury sea captain William H. Cleveland (1819-1893) and Elizabeth A. Winslow (1827-1903). For many years he was a harnessmaker, employed at the Crocker Harness Factory (Site #1), and later he worked for Walter H. Renear until, according to his obituary, "age and infirmity forced his retirement." In 1907 he was listed as a "hostler" at Walter Renear's stable (see Site #2.) He had married Ann Eliza Fish Gibbs (1853-1923; the daughter of John Randolph Fish and Sarah S. Hammond) in 1870 in New Bedford. (She had been born Ann Eliza Fish; after the death of her father in 1855, her mother placed her in the New Bedford Orphan's Home. In 1861, Ann Eliza was adopted by George W. and Mary Ann Gibbs and her name was legally changed to Ann Eliza Gibbs.) 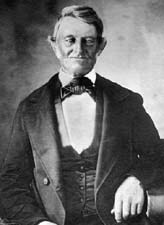 According to Cleveland's obituary, "In his later years, when he spent much time about the store of his son-in-law, he was well-known to hundreds of summer visitors, who developed a great fondness for this quiet, congenial old gentlemen and who loved to listen to his stories of old days in the livery business. A veteran of the age of horses Mr. Cleveland had many thrilling experiences with the animals, from which he did not always escape unscathed." 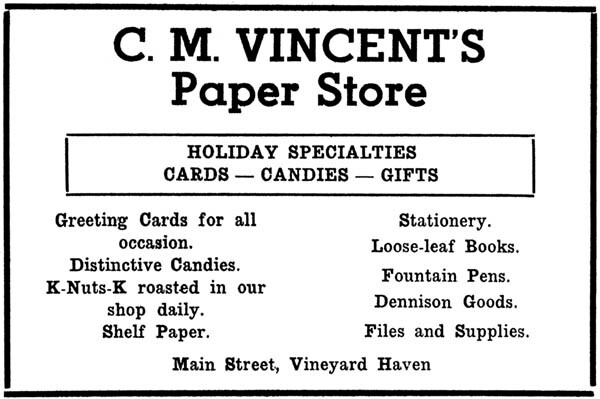 1916 Gazettes advertise Charles M. Vincent's store as the local agent for New Bedford Standard. The 1920 Tisbury census lists 39-year-old Vincent as a "newsdealer" with his wife, son Charles M. Jr., and Rose's parents. In 1920, and for many years afterwards, he advertised newspapers, periodicals, tobacco, and candies. In 1920 Vincent bought this property from his landlady, Lucy Bodfish, widow of Josiah Bodfish. oh yes. It was a very small store. It really was. But later, quite a long time later, his wife Rose became interested in a program that Dennison Company were developing making decorations and things out of crepe paper. They did a lot with colored crepe paper, the Dennison Company. So Rose found out, I guess she took some lessons on how to make all of these very pretty things, she sort of did that on the side in the store." "I 'specially went there for penny candy. Those long black licorice I think about that long. Kind of like rubber. And sort of the squirrel bars, you know the peanut bars. There wasn't a great variety. Gumdrops and things. But never great variety." "Rose used to sit down here - made these things out of crepe paper. In fact, when I got married she made a wedding bell - it was beautiful. She gave it to me as a gift. It was hung up over my head. She made some very pretty things that people bought." "Duffy. He was always known as Duffy." "Duffy" Vincent with the Vineyard Haven baseball team. 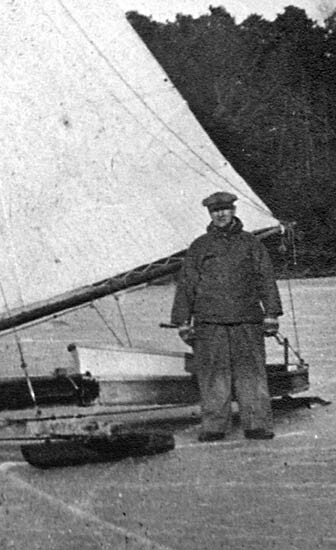 Charlie Vincent with his iceboat at Tashmoo. C. M. Vincent continued to advertise periodicals, candy, stationery, tobacco, and newspapers through the twenties and early thirties. In 1929 he also advertised art metal, steel desks, letter files, card index files, and waste baskets. 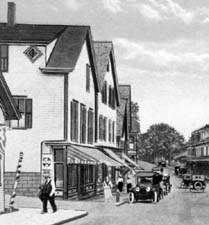 In late 1928, during a building boom on Main Street, Vincent built an addition to his store, adding one room. In the spring of 1933 Vincent advertised jigsaw puzzles, for sale and for rent. 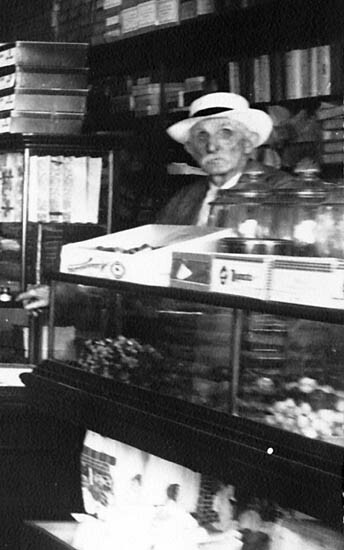 During 1929 and 1930 Miss Laura Silva (1902 - ; daughter of Antone Tavas Silva and Mary Joseph Santos) was noted as working as a clerk at Vincent's. "Oh, that was special. Oh, do I remember that. I tell you, if I were an artist I would draw the picture for you! I remember that store when I was about three years old. The winters were very, very cold here. And sometimes, you know, we wouldn't have boats here three or four days on end. The tugboats used to come in. And so [Charlie Vincent] had a big potbellied stove in that store, and I can just see the men sitting around with their feet on the stove. And then he had these great big boxes filled with merchandise I guess. Those boxes always seemed to be there. I remember a story from the Gazette, 'Why don't you unpack your boxes, Charlie?' And he said 'If I unpack them, I'll have to sell them and order again.' I don't know if the boxes ever got unpacked or not! "My mother dressed me in a little red teddy bear suit and I would go down there probably to buy some chocolate, maybe. We never had much money, but they had the old fashioned candy store's glass jars, you know, with penny candy. We didn't eat a lot of candy in our family. I remember there was wrapped candy - Tootsie Rolls, too, I think - but wrapped candy, maybe, is what I had. And they would sit there on those big boxes and I don't know what I did for them, I must have told a little story, or maybe they asked me questions, but there were all those old seamen there. And I remember that store, it was kind of dark. The boxes weren't unpacked. There was the stove in the middle there. And Mr. Vincent always wore a sweater. And I just remember a lot of men in there, it was kind of like a community center. I remember there was one man, Bert West, who always had a bag of peanuts. I think he lived on upper Main Street. He used to be in there I think. I think he bought his peanuts there. But he always gave me peanuts. He always had a little white bag of peanuts. "In those early days, nothing was open on Sundays. And usually nothing was open in the evenings, either. But on Sundays, that was a big day. I would go down the street to Vincent's. There would be a great big long line, because Mrs. Vincent was the one, the mother and the wife, who really handled the Sunday paper business. That was a big thing - that was a big thing! Because she didn't open the doors until I think it was like one o'clock and a great big long line of people waiting. The best picture I can give you is she presided over her papers. I mean they were all put together, and the crowd would come in, and you know papers were saved for people when you bought your paper. She was a very beautiful lady. Her hairdo, her white hair was always done so nicely, and she had her lovely suit on, a pretty white lace blouse. And she was behind that counter and she really presided over her papers. I remember there was the Sunday Advertiser, I remember, and then there was the Boston Herald. I don't about the New York papers. There was the New York Tribune, Herald Tribune I think it was called. There was the [New Bedford] Standard Times, I think it was called. "So anyway Vincent's Paper Store was a very, very interesting chapter of the old days on Main Street. It was really a lovely old picture that could have been on a Saturday Evening Post cover. You know, the big boxes, and the stove in the middle, and the seamen, and the men from the tugboats." Charles Vincent died in 1933. 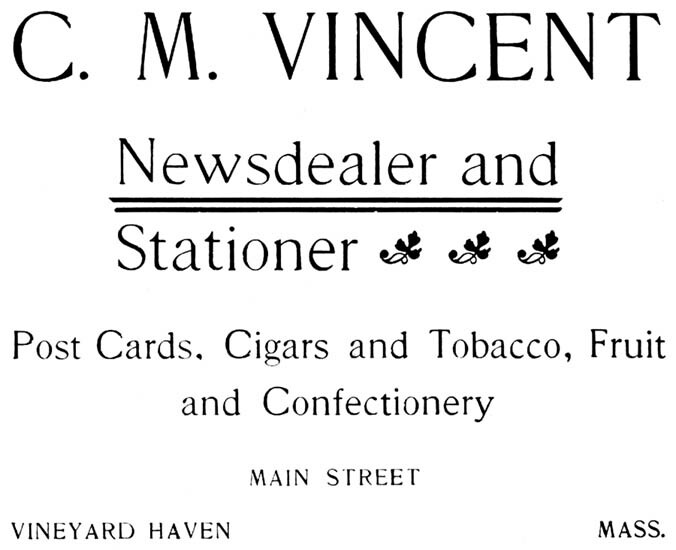 Vincent's News Stand continued under the management of Vincent's widow Rose and their son Morton. In a 1933 ad they advertised confections, gifts, stationery, and smokers' supplies; in 1934 office supplies, typewriter ribbons, files, ledgers, and account books; in 1935 periodicals, cashews, peanuts, and "Vincent's Lending Library"; in 1938 new account books, multi-column pads, business calendars, fountain pens, ink, and pencils; and in 1940 boxed candies and cards. 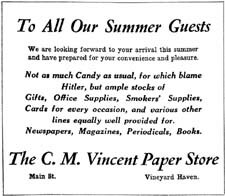 In May 1940 the Gazette announced the reopening of newly remodeled C. M. Vincent's newspaper store, and made mention of its "beginning as a narrow, poorly-lit tobacco store." The following month they advertised book rentals. Marge Taylor worked at Vincent's for many years. She said: "I started in '41. I worked for [Rose], and then she got sick and passed away and then I worked for her son, Morton Vincent. Then he eventually sold it to Tony Oliver. And then he moved from where Mardell is down where the Thrift Shop used to be, and that was the paper store for quite a few years there." "They didn't just sell papers. They sold cigarettes, they sold chewing tobacco, they sold mixed nuts, they sold candy, they sold gifts, and a lot of office supplies. One of the things I remember about the paper store - it was open until ten o'clock at night. And of course I was just out of high school when I worked there. And I don't know if you know anything about what they called the pogue[?] boats. Some old timer can explain to you which I can't. I don't know whether it was used for bait or what. They had the pogue boats, and the men would come ashore at night, and they would come in the store and I was petrified. They'd come in, and they'd buy a paper or a magazine or something. And I can remember I was scared to death of them. But they were harmless." 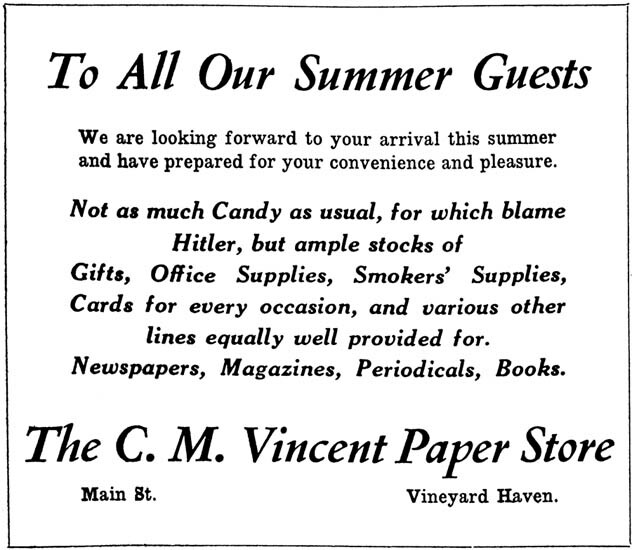 Many people living today still remember buying newspapers, games and greeting cards at Vincent's Paper Store during these years. 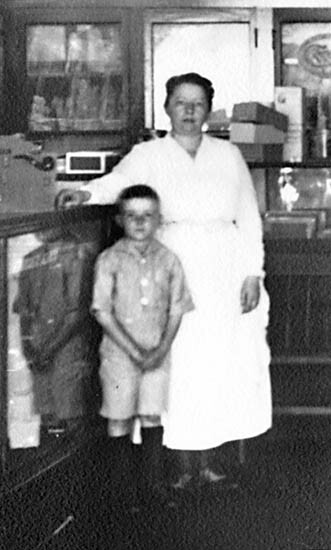 Employees included Mrs. Dorothy Paltz, wife of Raymond Paltz, who later worked at Vineyard Dry Goods (see Site #29.) Morton's wife Nellie Kucinskis, formerly the 8th grade English teacher at the Tisbury High School, also worked here. In March 1943 a fire at an express company trailer in Hyannis burned. Virtually the entire shipment consigned to Mrs. Vincent was destroyed. 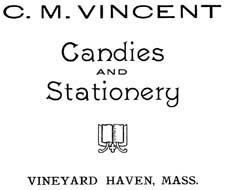 The Gazette reported that "Vincent's candy case in Vineyard Haven is very bare indeed." HG: "What I remember about Vincent's was there was never anything in there! It was the paper store. I remember the shelves were always bare. That what strikes me." JB: "Little gifty things I think." HG: "Yeah, one here and one there, but nothing in volume." "It was the paper store, and magazine, and stationery, and sheet music." "That's where I got my sheet music." JB: "I remember that too!" CI: "We were fans of hers, and we went in and bought this little pig thing." JB: "We sent it to her." CI "Yeah, we did. But she did collect stuff, little things like that. There was nothing really much in there, certainly nothing like what Mardell has now." Agnes Rice said: "Mrs. Vincent was a typical, kind of a friendly little lady. She was a typical little old lady, sort of prim. My father went in there every day to get the newspaper. My father always bought the Post, the Boston Post, because he was a Boston policeman. He bought that until it sold out." Rose Vincent died in 1946. Her obituary notes that "As a young woman she was employed as a clerk in one of the Main street stores, and following her marriage, she spent much time in her husband's place of business, Vincent's Paper Store. Since 1933, she has managed the business herself." Charlie and Rose's son Morton, a returning air force veteran of the second world war, took over management of the business. In May 1948 he advertised newspapers, magazines, tobaccos, gifts, candy, games, office supplies, greeting cards, candles, costume jewelry, and souvenirs. BW: Morton Vincent. Well, now, I'll tell ya. Morton was never in a hurry at all in his life, and if he stops to talk to you, you better be prepared for an hour, and he won't get out thirty-five words in an hour's time. But Morton inherited the store on Main Street that is now Mardell's, from his parents. And I remember his mother Rose Vincent, ran the store for years. Now Mort, when he sold the place he retired, he lives out on Tashmoo. Just putters around, does what he wants to do. He don't work any faster now than he ever did. she knows Morton very well. In fact Morton calls her "Doc." 'Cause she used to work for Dr. Mayhew. A copy of George Cleveland's Men From the Frozen North - who is Morton's uncle. I didn't want to give it to Morton, I didn't know how he felt about it. And Mabel let him read it, and boy he got a big kick out of that! He wanted copies of it and everything. He really liked that. 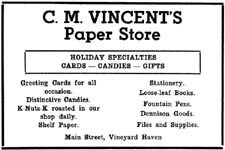 In September 1950, the Vincent's Paper Store business was sold to Anthony J. 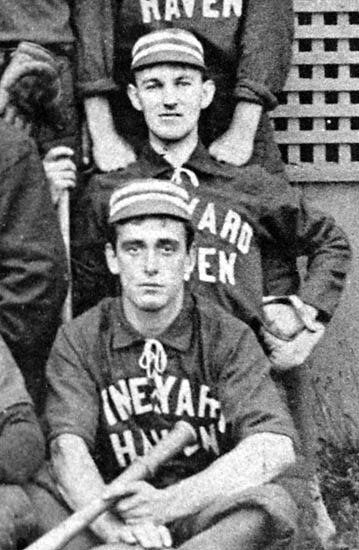 "Tony" Oliver of New Bedford. 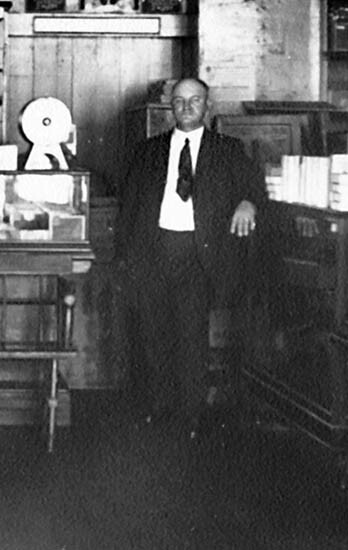 Oliver had been a salesman in the office supply business of F. S. Brightman Co. of New Bedford, had visited the island frequently, and was well-known in town. Vincent retained ownership of the building, and continued to live in the apartment upstairs. Vincent's staff , who at that time consisted of Mrs. Paltz, Marjorie Cleveland, Mrs. Bernice Benway, and Justin Welch, continued on with Mr. Oliver. Oliver continued using the "C. M. Vincent" name for several years. In May 1951, the newly renovated store featured a gift and art department, a greeting card department, office and school supplies, and newspapers, magazines, and periodicals. That season the "personnel" were listed as Dorothy C. Paltz, Marjorie Cleveland, Bernice Benway, Justin Welch, and owner Anthony J. Oliver. 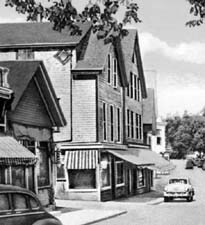 In November 1954, the Gazette announced that Vincent's Paper Store was moving to the "Call Block" (Site #30) the following month. He also changed the name of his business from "Vincent's" to "Oliver's." The paper noted that Oliver was to retain his store at this site another year under his existing lease and might conduct a summer shop here. In January 1956 the Gazette reported that Morton Vincent had remodeled and refurnished his store and was reopening his business under the name "Vincent's Gift Shop." The paper described "new shelving, a considerable expanse of 'plug-board,' new counters, both for display and wrapping, and new decorations, have transformed the place." In 1974, Morton Vincent sold this property to Robert H. "Bob" Clark and Mardell M. (Packish) Clark. Charles Morton Vincent died in March 1984 at the age of 68. His obituary noted that "After the news dealership, he ran Vincent's Gift Shop until his retirement due to illness. Friends will remember him best for his enthusiasm for his boat and for fishing on the Middle Ground."